Welcome to Super Walkable! 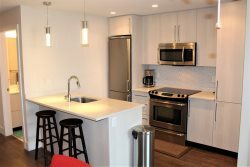 This suite is a brand-new, modern, 1 bedroom condo in the heart of downtown Victoria, wonderfully walkable to all the best that the city has to offer (WalkScore of 100). Located on the11th floor, the suite is south-facing, bright, and newly furnished with hotel-style linens and towels. The couch folds out easily to become a queen sized bed. With a pack 'n play and high chair included, this suite is ideal for small families, professionals or those visiting the city for vacation. You'll have access to the whole condo, as well as the common rooms of the complex.